Hernia is the abnormal squeezing out of an organ or fatty tissue through a weak spot of the wall of the cavity where it normally resides. A hernia can be caused by pressure and a weakness or opening of the muscle or fascia where the pressure pushes the organ or tissue through the weak spot or opening. The weak areas can include the groin, umbilicus, site of a previous abdominal incision, etc. Anything that cause an increase in pressure in the abdomen can cause hernia, which may include coughing or sneezing persistently, constipation or diarrhea, lifting heavy objects, etc. Poor nutrition, smoking, obesity are some factors that can cause muscle weakness and make hernias more likely. Other risk factors for hernia include COPD, pregnancy, peritoneal dialysis, age related wear and tear of the abdominal wall, inactivity, etc. Hernias most commonly develop in the abdomen, specifically the groin. A weakness in the abdominal wall can evolve into a localized hole or defect, and through this defect the abdominal organs or adipose tissue may protrude. Hernias can be of different types. Hernias may not be life threatening, but they don't go away unless treated. Hernia surgery may be required to prevent potentially dangerous complications. Hernia should be treated as they may rise many other complications including blockage in the organ and prevent blood flow and also affects the functioning of the organ. Strangulation of hernia causing stop to blood flow require immediate removal as they may lead to life threatening condition. Hernia causes pain and discomfort in the abdominal area while prolonged standing, walking and bending over to lift objects. What is Laparoscopic Surgery or Keyhole Surgery? Keyhole surgery is a minimally invasive surgical method with few small incisions with less tissue disruption. The surgeon inserts tiny camera attached instruments to view the abnormality caused by the hernia and carefully inserts other surgical tools to remove the hernia without damaging any other internal organs in the area. The camera captures pictures and the surgeon view the enlarged images of the organs through a monitor attached and perform the surgery through the images transmitted to video monitors. 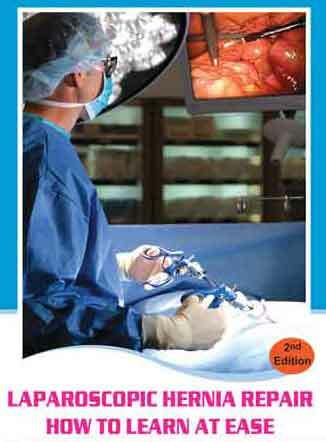 How Keyhole or Laparoscopic Hernia Repair is performed? The surgeon initiates the surgery by administering a dose of general anesthesia to relax the muscles and to put the patient in a sleep like state. Three small incisions are made in the abdominal wall with less bleeding and a balloon dilating device is passed to separate the peritoneum from the muscle layer. Once separated the balloon is replaced with a laparoscopic port and the abdomen is insufflated with CO2. A long thin tube like structure with a camera attached to one of its end (laparoscope) is inserted into the space to view the internal organs through a connected monitor. The images guide the surgeon throughout the surgery. Next the peritoneum is then gently pushed away from the muscle layer to reveal the sac of hernia and is pulled back into position. After repositioning the abdominal bulge a flexible polypropylene mesh is placed on the spot to cover the hole in the muscle. The mesh is fixed with tiny absorbable tacking devices. Lastly the incisions are closed with dissolving sutures. Laparoscopic surgeries/ keyhole surgeries provide you the best experience of the surgery due to the less pain and blood loss during the surgery.